NASA's Kepler space telescope has spotted the first Earth-sized planet in orbit around a star in the so-called Goldilocks zone – the zone around a star that's not too hot or too cold for liquid water to exist on the surface. "We know of just one planet where life exists – Earth," said Elisa Quintana, research scientist at the SETI Institute at NASA's Ames Research Center. "When we search for life outside our solar system, we focus on finding planets with characteristics that mimic that of Earth. "Finding a habitable-zone planet comparable to Earth in size is a major step forward," she explained. "M dwarfs are the most numerous stars. The first signs of other life in the galaxy may well come from planets orbiting an M dwarf." The planet, dubbed Kepler-186f in the journal Science, orbits a small M-class red dwarf star around 500 light years from Earth, and is about 10 per cent larger than Earth in size and with slightly stronger gravity. Kepler identified five planets orbiting around the star, with Kepler-186f the furthest out; it orbits its host star every 130 days. "Being in the habitable zone does not mean we know this planet is habitable. The temperature on the planet is strongly dependent on what kind of atmosphere the planet has," said Thomas Barclay, research scientist at the Bay Area Environmental Research Institute at Ames. 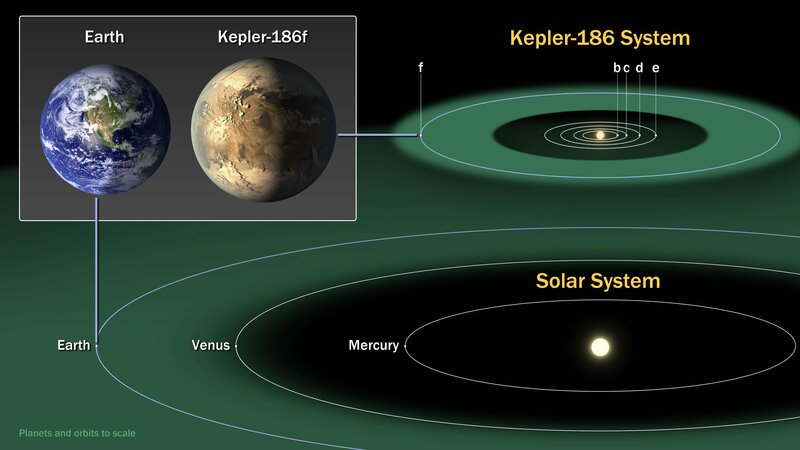 "Kepler-186f can be thought of as an Earth-cousin rather than an Earth-twin. It has many properties that resemble Earth." Sadly, there's no way to find out what kind of atmosphere Kepler-186f has – the planet is too far away and its sun is too dim to allow those kind of measurements. Barclay said the sun would need to be around 100 times brighter to show those details, but the fact that red dwarfs have these kinds of planets is tremendously encouraging, he said, since red dwarfs make up about 70 per cent of the stars in our galaxy. At a press conference on Thursday, Victoria Meadows, professor of astronomy at the University of Washington, said that the planet is closer to its sun than Earth is to our star, but only receives around a third of the sunlight we do, but that that's more than enough for plant life to thrive. "There's no good reason at the moment why M-dwarf planets could not be habitable," she said, "so we do consider them to be perfectly viable potential places for habitability. This particular planet is small, so that really increases its probability of being rocky, habitable, and able to support liquid water in oceans.